There’s superman, batman, spiderman, etc. 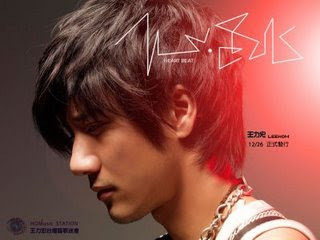 Also there’s a music man name LEE HOM, he is a talented Taiwanese artist, producer and at the same time writer with Sony BMG. He a charming musician that can plays over 10+ musical instruments including violin, piano, guitar, xylophone, drums, accordion, bass, harmonic & er hu. Fantastic, no? He is most known for his Chinked Out style that combines traditional Chinese music such as Beijing Opera with Western hip-hop rhythms, which is rather different from many other artist. I also heard that he only start learning Chinese at the age of 18. But, he does produce great Chinese music, I don’t know how, but he just did it. Yea. For this, I pay my respect to him. & the thing is, LEEHOM is going to hold his MUSIC-MAN LIVE KL CONCERT soon enough. The thoughtful S.O.X. has come up with a way that you can actually win 2 Leehom’s Music Man Live in KL concert tickets. 1st, join and become an S.O.X. member. How? Bring along your original I/C or Passport to any selected Celcom branches or Blue Cube outlets for registration. The starter packs are available for free but customers are required to purchase a RM10 prepaid reload card. p.s. – Only one customer is entitled to register for one S.O.X. starter pack. p.s. – Upon receiving confirmation via SMS, reload a minimum of RM20 before 26 April for a chance to win. Besides, you can also send your best “Music-Man/Woman” video or picture for a chance to win tickets to Lee Hom Music-Man LIVE in KL 2009. Also, do note that the promo period is from 1 to 25 April 2009. So, what are you waiting for? 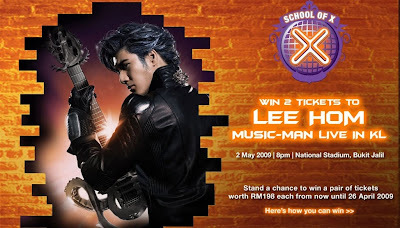 Make sure you move fast to win a pair of tickets worth RM198 each to Lee Hom Music-Man LIVE in KL 2009!! How to upload your video? Furthermore, you are able to view, rate and download video/pictures from MeTv by….. Step 5: To rate videos or pictures click on the Rate It link. To download videos or pictures, click on the Download Now button. lee hom? he reli talented and im love "kiss goodbye". p/s:however,dream is just suitable for a worst guy in the world like me xD nice blog anyway. but really, his songs r damn nice !! wat was the whole scene about anyway? stanley – don’t worry, there’s U.O.X. ;) hee. thanks yea. ruki – uhh. why brave. haha. I cannot tahan. keep laughing. MGSxF – I don’t know.. hmm. lol..
i also wanna act along side u… :) can?? Btw, not sure you remember me or no, just now i had request to make some post and let me have some photo shooting..
Had a good rest after a hardwork in pc fair , cheers. chasing dream – he is not kissing me!!!! omgosh! Jian – well. hmmm. speechless. anyway. yea. I prefer Jay too, his song is simply awesome. siukeong – yea. i still in UTAR. ;) haha.ern. I cant really recognize you. too crowded today. =( anyway, sent you a mail. cox u 2 dare to take the video in cafe..
walao ehhhh.huaibin pok mong! LOL.Guys who are jelous of huaibin please raise up ur hand. LOL. Haha, indeed it was a funny video to see huai bin hug you and like apologizing for something.. Okay, my singing is terrible but when you dub it over, the overall effect is great. Wah…… your mv *ahem…… nice try *haha I cant said it bad because your 1st mah. And your old video clip(MCD final) thats want quite funny. daniel tong – tall? why sudd oni? ruki – he insisted too. haha. ruionkoh – no pok mong la. haha. zues – haha. I keep controlling myself from laughing. ptsk – wa, impossible lo. huaibin – walao. my acting skill cacat 99 weih. haha. ??? – uh., u saw the mcd one??!! saw u loh.. wah lao eh.. damn tall lor.. but still shorter than me geh… i still taller than u geh..
Too bad. Well, it’s okay. You can still watch it through ntv7.com. =D But I’m not sure when only the show will be uploaded. Mm, I’ll keep you posted, kay? Tee-hee. YA…… haha. after you finished watch the MV, it will show up all video clips under your name mah so the MCD also under your name XD.